Designation for the totality of all meteorological processes or possible weather conditions including the typical sequence as well as the daily and seasonal fluctuations, which are responsible for the average state of the earth's atmosphere at a certain place. The name (Greek climate = curvature) is derived from the curvature of the globe and the resulting locally different sun angle. The climate is characterized not only by processes within the atmosphere, but rather by the interplay of all the spheres of the earth (continents, seas, atmosphere) and the solar activity. As a demarcation to the Weather (Hours to weeks) and the weather (a few days to a week, even a month or a season) is understood as climate over the period of several decades (at least 30 years) statistically determined state of the earth's atmosphere. Areas of the same climatic conditions are classified and classified in climatic zones. 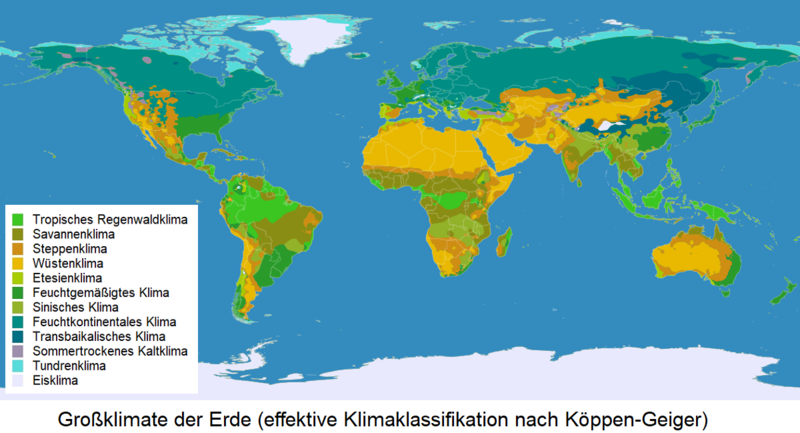 There are different classifications; the best known is from the German-Russian climatologist and biologist Vladimir Peter Köppen (1846-1940). This was then continued by the German meteorologist Rudolf Geiger (1894-1981). The climate characteristics result from many factors such as exposition (Sunlight), precipitation. temperature. humidity and wind as well as their sequence and interaction. Next to the soil type who planted there vine and the individual nature of the winemaking Climate is a deciding factor for the climate wine quality, But also the very special climatic conditions for a small area in which the vineyard is located (small climate, climate location), and even smaller occurring conditions (microclimate) play an important role. The vine grows best in warm, temperate zones of the northern and southern hemispheres, the so-called vines belts, These are the relatively narrow areas between 40th and 50th latitude on the northern and between 30th and 40th latitude in the southern hemisphere. The grapevine Above all, it needs warmth and light. The optimum temperature for growth is according to research by the research institute Geisenheim between 25 and 28 ° Celsius. This is mainly determined by the altitude. As a rule of thumb, it drops by 0.6 ° per 100 meters difference in height. A hillside is ideal for sun exposure. In addition, the thermals are cheap, because the cold air currents fall down the slope at night, where they are heated from the morning and hiking back up during the day. This cycle is mainly for white wines in terms of acidification important. The tops of hills are planted with trees to curb the influx of cold air, which is used in Europe especially in Germany, Austria and France. To exert a positive climatic influence on viticulture waters (Rivers, lakes, oceans) because it reflects the light. It is no coincidence that many important winegrowing areas are located in waters. The northernmost vineyards for quality wine growing are located in Germany (51st latitude) and England (52th parallel). The southernmost Weinbaugrenzen are located on the Cape in South Africa (35th latitude), in Argentina and Chile, as well as on the southern main island New Zealand (40th parallel). From the equator to the 20th degree north and south latitude, there are tropical Conditions with heat and drought no viticulture, or only in higher areas in up to 2,000 meters above sea level such. In Kenya, Outside these areas there is too little sunshine and rainfall or the risk of cold and frost, The suitability of a region for viticulture is under Weinbauwürdigkeit described. This page was last modified at 29 September 2012 at 14:59.